Immediately after I posted on Tuesday, I recalled I could disable apps. This still does not remove the app, but it removes it from the list of apps on your phone when looking through your app gallery. It also removes it from showing up on the list of apps to be updated. There are still some apps that can't be disabled, like the Verizon voicemail app. I believe it can't be disabled because the app is probably considered a crucial app for the phone. 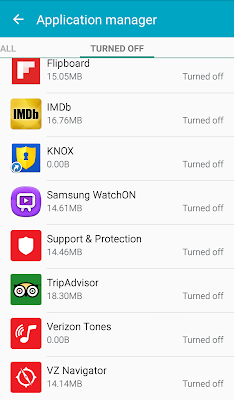 I've disabled quite a few apps, and I need to go through my apps again to see if there are any remaining apps I can disable. Now when updates come out, I should be able to press "update all" instead of updating apps individually. Before, I was applying updates individually to apps because I didn't want to update the bloatware apps. Disabling apps will work for now until I get my next phone. I'm still not decided on what phone I will get, but it will be a phone that does not come with bloatware.